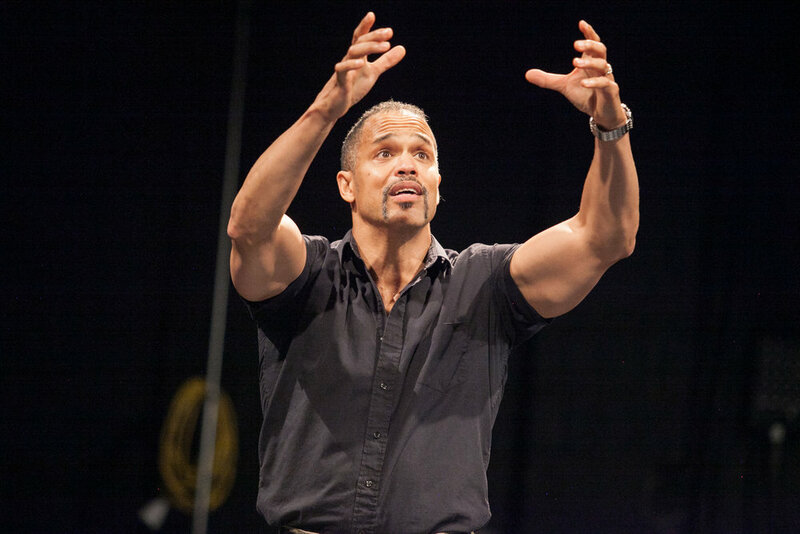 Keith Hamilton Cobb acts in “American Moor,” showing this weekend. Actor and playwright Keith Hamilton Cobb sat down with artist Curlee Raven Holton last Friday, Nov. 3 to talk about Shakespeare’s “Othello” and their experiences as Black male artists. The event, moderated by English Professor Amy Rodgers, is part of Cobb’s nine-day residence at Mount Holyoke College which began on Nov. 3 and will last until Nov. 11. According to Mount Holyoke’s website, this residency will be focused on “fostering honest, difficult conversations about race in America across the color barrier.” At the center of this conversation is Cobb’s critically acclaimed play “American Moor,” a work that examines Cobb’s own experience as a Black actor and that reinterprets “Othello” through this lens. Cobb’s discussion with Holton, whose sepiatoned reimaginings of the most significant scenes of “Othello” are currently on display in the art museum, kicked off his residency. Cobb noted that while his own work differed significantly from Holton’s in regard to medium, their intents were the same: to “make clear that, through the African American lens, ‘Othello’ might be an entirely different thing than all the white world will ever see or understand.” He explained that his race was inextricably tied to his career as an actor, and said that he found himself painfully aware of the way it affected his experiences and opportunities. It was this awareness and journey that led Cobb to write “American Moor,” a piece he hopes changes the way audiences view their lives and the world around them. “Othello,” through Cobb’s eyes, is a work that captures the isolation and adversity that is associated with being a Black man in a country that will always see them as foreigners. There is much more to the character than the tired story of a Black man losing his temper and inflicting violence upon a white woman, he said. Cobb described Othello as a man with PTSD, experiencing unconditional love for the first time, and terrified of what would happen to him should it be taken away. He argued that there are layers to Shakespeare’s character that can be uncovered by examining his situation in a modern context and by looking at him through the lenses of race and politics. This is why, according to Cobb, it’s so important to continue examining texts like “Othello” today. Holton’s “Othello Re-imagined in Sepia” series explores the play from a different standpoint. According to the artist, his works magnify the source material, not necessarily reworking them but rather re-interpreting them. His sepia-toned etchings, completed in Venice, show the character of Othello as he is, a lonely figure in a place where he isn’t allowed to belong, said Holton. These emotional works seek to capture the character that Cobb insists is tucked within the folds of Shakespeare’s words, hidden under hundreds of years of history. Cobb emphasized the importance of analyzing these works to the best of our abilities, taking time to extract all the meaning we can from such valuable literature. During his residency, Cobb will be staging several performances of his critically acclaimed play “American Moor,” a provocative and emotional work examining Cobb’s Blackness as it relates to his acting career and how his experiences are reflected in Shakespeare’s “Othello.” The show will be playing Nov. 8 through 10 at 7:30 p.m. in Rooke Theatre. Tickets are available online through the Mount Holyoke website.